The Fifteenth Winter Games were bigger than ever. The number of nations taking part rose to 57 and several new events were introduced: team competition in ski jumping and combined, Super-G, alpine combined, and 5000 m. for women. The Dutch Yvonne van Gennip won the three longest skating events, while Katarina Witt retained her figure skating gold of 1984. 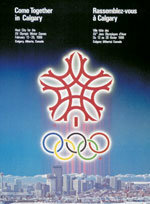 Calgary was for Norway the worst ever winter Games, without a single gold medal.